I get calls from dog owners all over Michigan and even in other states who do not have a clue what to do with their puppies or dogs. Sometimes they've adopted a puppy or dog and it is displacing behavioral issues. Sometimes they have a dog who is aggressive or has become aggressive and it's biting them or family members. So, I'm constantly on call, traveling to homes with various issues from hyper crazy dogs that jump and bark to dogs that could literally bite my head off. I love my job, especially when I'm able to give dog owners the tools they need to modify their dog's bad behaviors and get them to mind them. In the beginning, many times, I have to work one on one with the dog to get him/her to calm down and listen. My goal is to get the owner to be able to control them in the quickest amount of time possible. Some clients I work with only need one or two private dog training sessions, others may need weeks or months of rehabilitation, depending on the environment this dog has come from and it's condition and temperment. I've been working with Patricia and Shadow since January. She adopted Shadow from a shelter, knowing he was not good with men and had severe aggression. Shadow bit Patricia and drew blood on her three times and left bad bruises. This was a horror story and I was terrified for Patricia's safety and didn't know if I could even help when I first began training Shadow. Shadow was so restless, out of control, jumping, barking, and trying to bite anyone that came near Patricia's house, including me. For the first six weeks of training Shadow had to be muzzled. Although German Shepherds are an intelligent breed, and Shadow picked up quickly on the basic and even more advanced obedience commands, he still had issues behaviorally. As you can see from the picture above, Patricia is not a young woman, yet she was determined to rescue this dog, knowing that if she took him back to the shelter, they would have no choice but to put him down. Week by week, Shadow made progress. 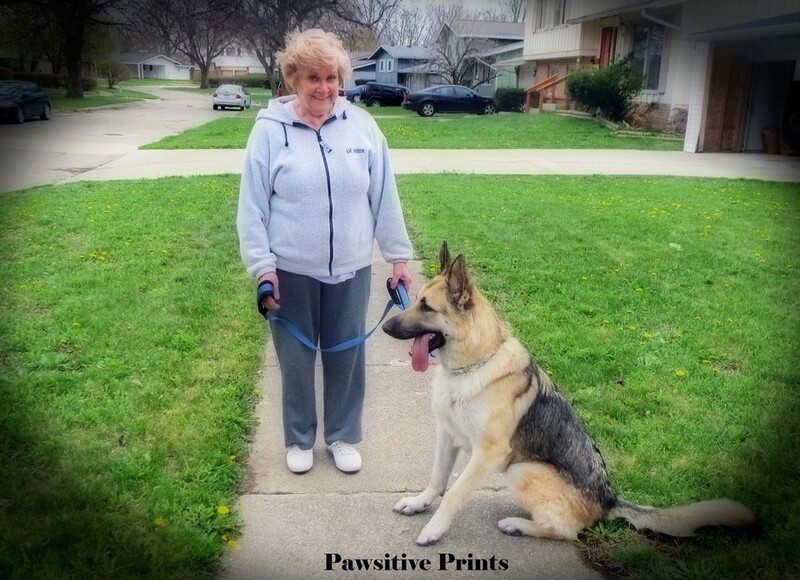 We invited Patricia's male neighbors into the home and worked with Shadow on his barking, jumping, growling. He learned to have manners and they even were able to pet him. At first muzzled, now unmuzzled. Now we are training him outside on leash for walking. At first he was like a bucking bronco trying to break free from the collar and leash, barking at everyone he saw, and pulling to every tree he wanted to mark. After just three walks, Patricia was able to walk him through the neighborhood on a loose leash and he didn't bark at anyone. I was so proud. Then, we turned a corner to finish up a loop around the block and a Pit was outside in a fenced yard barking ferociously. Shadow stood up on his hind legs, pulled fierce on the leash, nearly knocking Patricia over. Barking, jumping, and pulling he wouldn't settled down. I was shooting a video at the time, but quickly took the leash. That's when Shadow took two swipes at me, nearly biting my arms. Thankfully he didn't bite me or anyone else and I was able to get him under control and away from that dog. Even though this was terrifying, I'm so glad it happened when I was there, because if this would have happened when Patricia was by herself the end result could have been fatal. Now I know we need to continue our training, desensitizing him to other dogs. I realized through the dogs I work with as well as my own dogs that training a dog isn't just for a season, training is for life! Dogs are like children, they keep learning and can develop more behavioral issues or build on old ones if we don't deal with the problem at hand. Yesterday I heard someone say that their new puppy only growled at someone when he had a bone. That is a beginning sign of aggression. Meaning if that behavior doesn't stop now, it will only grow, and later when this pup becomes a dog it could very well hurt someone. Patricia was smart to work with a trainer. Shadow is well behaved now in her home and licks my hand when I come. He's good with her neighbors too. Now it's just getting him used to other dogs! As dog owners and dog trainers our job is never done! Lisa Freeman is a Motivational Speaker and Top Dog Trainer in Michigan. She teaches, trains, and empowers others to reach their highest potential. An abuse survivor herself, she specializes in rescue and recovery. She helps abused and bullied people and pets and also works with bullies to rehabilitate them.